This seems to have been posted in late July, but several people have brought it to my attention today. 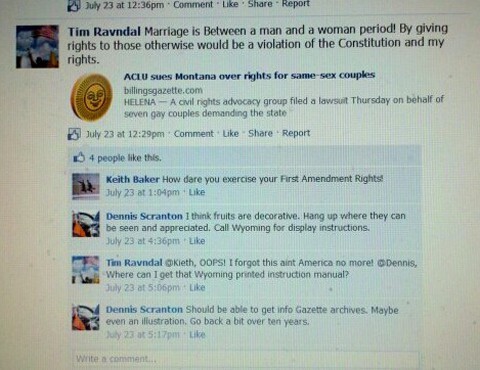 Tim Ravndal, the President of Montana's Big Sky Tea Party Association, expressed his views that marriage should be between a man and a woman in a Facebook posting. The post was in response to an ACLU lawsuit in Montana brought by seven gay couples who want to get married. Then Ravndal expressed support for a commenter who (in apparent reference to the Matthew Shepard murder) said, "I think fruits are decorative. Hang up where they can be seen and appreciated. Call Wyoming for display instructions." Answered Ravndal: "Where can I get that Wyoming printed instruction manual?" In related news, the Montana GOP Platform calls for making homosexual acts illegal.